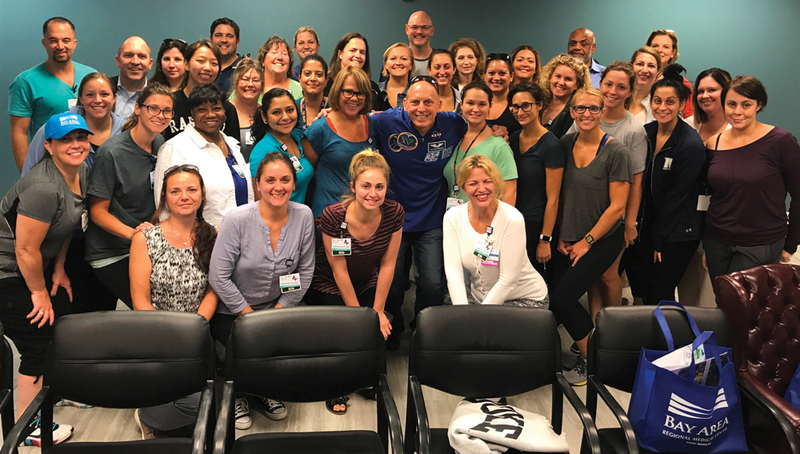 Visiting nurses from New Jersey, along with hospital CEO Stephen Jones Jr. and Chief Nursing Officer Michelle Henderson, RN, have a photo op with astronaut Clayton Anderson, center, while visiting here and lending a helping hand at Bay Area Regional Medical Center. Nurses from New Jersey, New York, California and Massachusetts made their way to Bay Area Regional Medical Center in the days after impact to relieve staff to get much needed rest and to begin the process of cleanup and rebuilding. Nurses from New Jersey landed at Ellington Field Aug. 31 and have spent time helping at the hospital and volunteering to demo nurses flooded homes along with volunteering at shelters.